New Haven, Mo. - Last week 29 future Lady Shamrock stars in grades 4 through 7 attended New Haven's annual girls basketball camp. Pictured left to right: Back row Assistant Coach Leslie Wyatt, Head Coach Jennifer Croy, Front row: Kathy Oetterer, Kayla Oetterer, and Rodney Oetterer. Photo courtesy of North Central Missouri College. Trenton, Mo. 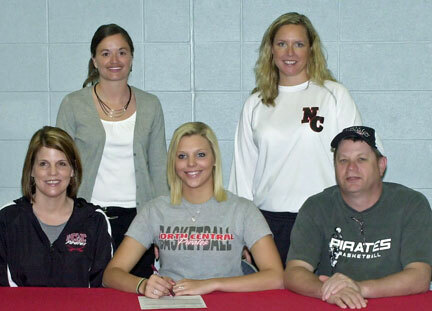 - Tuesday afternoon the North Central Missouri College Lady Pirates basketball team has signed its first recruit for the 2013-14 season. Kayla Oetterer, a 5’11” forward from New Haven, Mo. 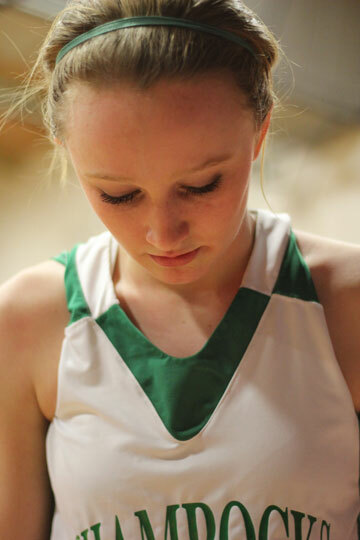 has made the decision to continue her basketball career at NCMC. Oetterer is a 2012 graduate of New Haven High School and received a unanimous nomination to the Missouri Sports Writers and Broadcasters Association’s All District First Team in 2012. 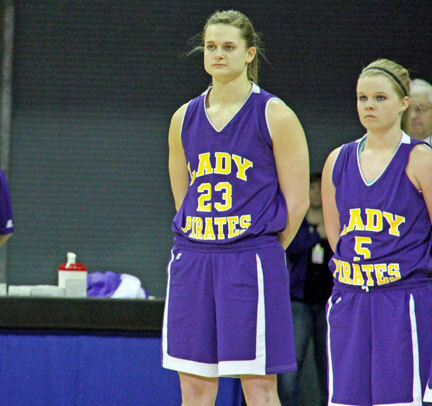 Miranda Brandt (left) and Alyssa Bullock (right) Stand side by side during the national anthem before playing their last game in the Class 1 State Championship Final. 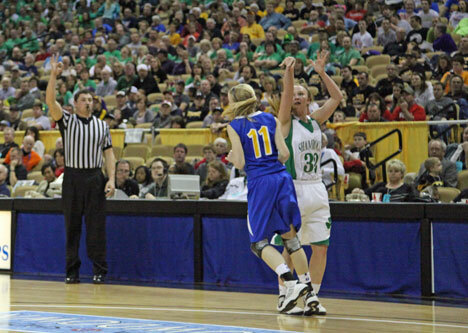 Miranda Brandt and Alyssa Bullock were recently selected to the Missouri Basketball Coaches Association Class 1 All-State team after leading Chamois to the schools first ever appearance in the Final Four, coming up one point shy of a State Championship. Rarely will you find a team with two players in the same grade top 1,000 career points or rank in numerous all-time record categories. I know for a fact it never crossed Bullock or Brandt’s mind they would end their careers among the greatest high school players of all-time in different record categories such as three point field goals made or career rebounds. NOTE: You can vote every 24 hours. The Lady Pirate’s incredible postseason run has earned them a nomination for the KRCG 13 / Jefferson City HyVee Team of the Season. The Lady Pirates are among the 12 teams that were announced earlier this week. The team who receives the most votes will receive a $500 check for its booster club, which means they need your vote. 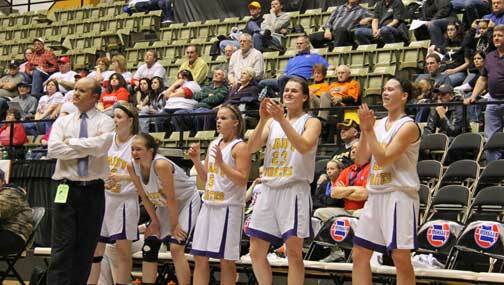 Click here to vote for the Lady Pirates. Photo by Quick News contributor Megan Bauer. Rachel Steinhoff posted career high numbers this past season, earning First Team All Conference for the second straight year as well as being a unanimous selection. Thursday the Missouri Basketball Coaches Association also voted Steinhoff for the second straight year to the Class 2 All-State Team. Steinhoff was listed second behind player of the year, Carrie Shepherd from South Pemiscot. One other notable, St. Elizabeth’s junior guard Savannah Stiles was voted to the Class 1 All-State Team, who is the daughter of New Haven’s Edward Jones agent Jim Stiles. 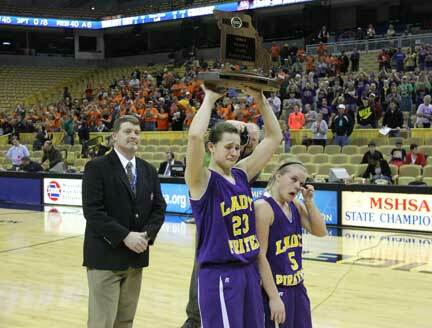 Alyssa Bullock stands next to Miranda Brandt as she holds the schools first ever state trophy. It was not the ending they hoped for but what they gave their community was more than they could imagine. Columbia, Mo. – If Chamois and Walnut Grove faced off ten times they’d both win five. 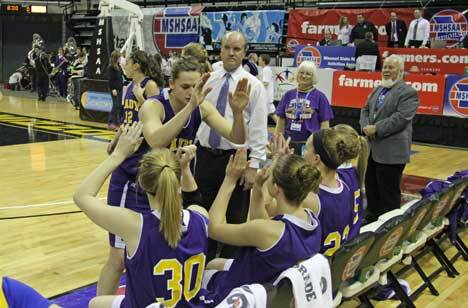 After the opening tip it was obvious that Saturday’s Girls Class 1 State Championship would come down to the wire. Both teams battled back and fourth with 13 lead change and 13 times when the score was tied with neither team taking more than a six point lead. Miranda Brandt finished her illustrious high school career with a “Michael Jordan” like performance, tearing apart Walnut Grove’s defense and nearly leading her team to Chamois High School’s first ever State Championship. Brandt was practically unstoppable, finishing with a game high 31 points and 13 rebounds. Rachel Steinhoff hits a three to give New Haven a four point lead during the second quarter. Columbia, Mo. - Saturday night New Haven became just the third team since 2003, after moving up a class, to play for a state title twice in as many years and the only team in school history to reach the final four as a Class 2 school. Despite Rachel Steinhoff’s career high 26 points New Haven was unable to match Crane’s depth and aggressive defense, leading the Lady Pirates to their first State Championship 55-45. Chamois' starting five played all but one minute in Thursday night's game, which has been the same all season long. Most of the time playing all 32 minutes. Columbia, Mo. – The purple storm will be more like a hurricane Saturday night after Chamois stomped Mercer 62-39 in Thursday’s Class 1 semifinal. Chamois had four girls score in double figures but it was the young sophomore Page Nolte who played the game of her life; pulling down a game high 15 rebounds and scoring 16 points. Nolte’s counter part Miranda Brandt had a game high 23 points and 14 rebounds.